This article was written by Dr Ben Kim He has a website www.drBenKim.com He has a great deal of health information and great products on there. I have been buying his tooth soap for some time now. This article explains the importance of getting enough Vitamin D and how to get the right levels. Your body needs dozens of different nutrients to survive and thrive, and every nutrient that has a nourishing effect on your body works together with other nutrients and your body’s self healing mechanisms to keep you well. With that said, it’s become exceedingly clear that vitamin D appears to be one of the most important nutrients we need to prevent all types of disease and live as long as our genetic potential will allow. If you work indoors and do not get some exposure to sunlight on a regular basis (free of wearing sunscreens and makeup), it’s quite possible that you are compromising your health by being deficient in vitamin D.
The fact is, it’s extremely hard to get all of the vitamin D that you need to experience your best health without some exposure to sunlight. Without vitamin D production from exposure to sunlight, you would need ten glasses of milk that’s been fortified with vitamin D to get the minimum amount of D that you need each day. And if you’ve been following our blog, you are aware of the many health challenges associated with consuming dairy products, including recurrent ear infections, sinus congestion and infections, eczema, psoriasis, rheumatoid arthritis, and many other chronic, degenerative health conditions. The bottom line is this: intelligent exposure to sunlight on your bare skin is the best way to ensure optimal vitamin D status. And with sunlight-generated vitamin D, you don’t have to worry about having too much D in your system, as sunlight destroys any excess vitamin D that it generates in your skin. This is an important point, as having too much vitamin D in your system can be problematic. 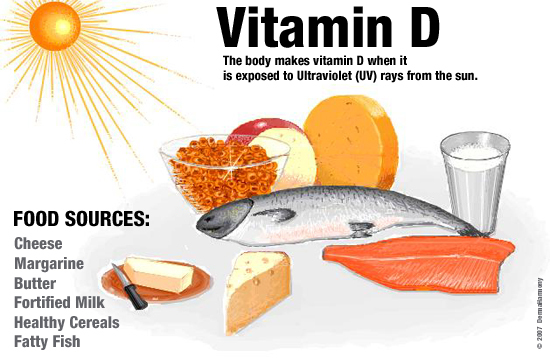 To make vitamin D, you need UV-B rays to come into direct contact with your skin. UV-B rays cannot penetrate glass, so you don’t make any vitamin D while you’re sitting in a car or by a window at work or at home. Lighter skin color allows deeper penetration by UV-B rays, which decreases the amount of sunlight exposure needed for adequate vitamin D production. If you have darker skin, it’s harder for UV-B rays to penetrate your skin and create vitamin D, which means that you need greater exposure to sunlight than someone with lighter skin. With each passing year, natural degenerative changes that occur in your skin make it harder for UV-B rays to convert cholesterol in your skin into vitamin D. It’s a known fact that elderly people need to rely more on food sources than sunlight for their vitamin D. At 70 years of age, the average person has approximately 30% of the capacity to generate vitamin D from sunlight that a 20-year old has. There’s a growing mountain of evidence that indicates that having enough vitamin D in your body is essential to reducing your risk of every disease that we know of. Every single one, no exaggeration. Unfortunately, the only way to know where you’re at is to ask your doctor to include 25 (OH) D, also known as 25-hydroxy D, with your blood work during your next checkup. Some labs test for 1,25 hydroxy D, which isn’t as accurate a marker of your vitamin D status as 25 hydroxy D, so be sure to specifically ask for 25 hydroxy D.
The 50 to 60 range is based on numerous studies that show strong relationships between these levels and reduced risk of a wide variety of chronic diseases and increased lifespan. This range is also based on the 25 hydroxy D levels of healthy people living in areas of the world (tropical and subtropical regions) where it’s quite common to receive more than enough sunlight exposure to ensure regular vitamin D production. But here’s an important point that you want to keep in mind: When sunlight creates vitamin D in a healthy person and that person’s 25 hydroxy D is in the optimal range, that person is almost certainly benefiting from other natural compounds that are generated with sunlight exposure. Dr. Holick calls these other compounds “photo products,” and he and his team are currently researching the makeup and benefits of these photo products. Put another way, establishing optimal vitamin D status mainly via healthy sunlight exposure may provide more health benefits than establishing optimal vitamin D status mainly via foods and supplements. Correct usage of foods and supplements only gives you the right amount of vitamin D – they don’t generate the photo products that sunlight does. As more information about these photo products becomes available, I’ll be sure to provide an update. At the same time, it’s worth remembering that even responsible exposure to sunlight comes with some undesirable effects, like premature aging of skin and possibly increased risk of non-melanoma skin cancers, depending on your history of sunlight exposure. So it’s too early to say which is more desirable between getting vitamin D mainly from sunlight vs. mainly from foods and supplements. It’s near impossible to provide specific recommendations in this area because of the many factors that affect your ability to generate vitamin D from sunlight. But we can provide general guidelines that should be helpful. If you live in the tropics or subtropics, you have access to UV-B rays from the sun year-round, so it’s quite possible to get most or all of your vitamin D requirement from responsible exposure to sunlight, though recent studies indicate that a significant percentage of people living in Florida are vitamin D deficient because they just don’t get enough exposure to sunlight. It’s possible to live in the tropics and subtropics and not make enough vitamin D from sunlight alone. And it’s possible to live in the mid-latitudes and high latitudes and have enough vitamin D in your system without eating vitamin D-rich foods and supplements throughout the winter if you generate sufficient reserves during warmer months. Clearly, this amount of time will vary from day to day and season to season. Dr. Michael Holick has tables in his book, The UV Advantage, that provides guidelines on how many minutes this would be for six different skin types at different times of the day and different months of the year for the four zones shown in the map above. If you want this type of guidance, it’s best to purchase his book for these tables. If you prefer more of a natural and instinctive approach, you should just aim to get enough sunlight on your arms and legs to feel like you’re getting about halfway to the point where your skin will feel like it has gotten a healthy tan. For days when you have to be under the sun for longer than about half of your minimal erythemal dose, once you get to this point, you can use protective clothing and hats, non-toxic sunscreen, or a combination of protective elements to ensure that you don’t get burned. The easiest way to figure this out is to have your blood tested for 25 hydroxy D. If you’re below 50 ng/ml, you can get more vitamin D through sunlight and/or take a vitamin D supplement. If you live in the subtropics or tropics and you aren’t shy about getting sunlight exposure, chances are that you don’t need to take a vitamin D supplement, but again, the only way to be absolutely sure is to get a 25 hydroxy D test. Ask physicians who regularly check 25 hydroxy D levels in their patients, and I’m confident that they’ll agree that vitamin D is easily the most widespread nutritional deficiency in today’s population, especially among the middle and upper classes. These days, I rarely encounter a person who can’t benefit from adding an additional 1000 IU to their diet above and beyond what is obtained through sunlight exposure and eating the foods listed above. Dr. Holick feels that every adult and child needs to take a minimum of 1000 IU of vitamin D along with a multivitamin that contains 400 IU of vitamin D.
The 100% whole food D-3 supplement that I use and recommend to my clients can be found here: 100% Whole Food Vitamin D3 supplement – I am now taking two of these tablets a day plus my regular dose of cod liver oil. I’ve even run into some clients who needed to increase their intake to 4000 or 5000 IUs, and in one case, 10,000 IUs per day to get their 25 hydroxy D in the optimal range – this last case was a woman who suffered with a severe deficiency (15 ng/ml) and symptoms of osteomalacia. The science surrounding the human body’s need for vitamin D is groundbreaking in every way, and ensuring that you are getting enough is a guaranteed way of significantly improving the quality and length of your life. It was impossible for me to include everything I wanted to in this post, so I’ll be writing shorter bits that explore different facets of vitamin D in the coming weeks. If you have any thoughts on this topic that you’d like to share, please use the “add new comment” featured below.